ABCey Presents: Top 10 DIY Event Invitations! First impressions matter, so why not make your invites something your guests will never forget? Get creative and try out some funky and unique DIY event invitations! These affordable and fun invitations are a sure way to get your guests talking about the event well in advance! Set the tone of a summer party and send out some easy to make no-melt popsicle invitations! Add a splash of color to your invitations with this rainbow pop up! These cute and trendy snow globe invitations can be used for almost any kind of event! In order to read the balloon invitation, the guest must blow up the balloon! They are easy to make and customizable for any occasion! These clever and cute film rolls make the perfect event invitations! 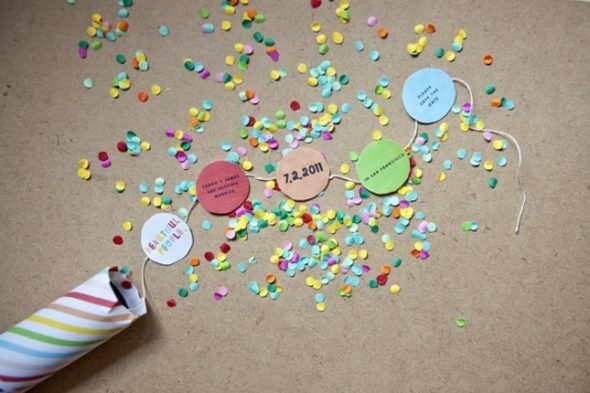 Confetti burst invitations are an exciting and memorable way to invite your guests that they won’t see coming! This clever invite comes with decoding glasses that allow the guest to read the invitation! These cute and trendy ladybug invitations are perfect for birthday parties or spring and summer events! Flip flop invitations are the perfect way to invite guests to a summer event. Too bad these aren’t wearable! Mini invitations are an adorable way to invite guests to any kind of event! Each invitation can be personalized for specific guests! These invitations are a fun way to get your guests thinking about your upcoming event. Make a statement with one of these unique DIY event invitations! What are your favorite DIY invitation ideas? Let us know in the comments below or on Facebook and Twitter!